Annealing: A process which softens a metal by first heating and then slowly cooling it. Annealing removes stresses and improves machineability. Bell Jar System: A relatively small protective atmosphere heating system designed for low volume production or lab use. Parts are heated in a sealed quartz "bell jar" to eliminate oxidation, scaling and carbon build-up. Brazing: A method of joining two pieces of heated metal together with a third, molten filler metal. Brazed joints have great tensile strength – they are often stronger than the two metals being bonded together. Capacitor: An electronic component that stores energy. Capacitors are used to smooth out or "decouple" the output of an induction heating power supply. Conductive: An adjective describing a material that transfers heat. Induction heating coils are usually made of copper, a highly-conductive metal. Conduction Losses occur when heat is transferred between materials in direct physical contact. Heat loss to the fixture holding the part being heated in an induction coil is a good example of conduction loss. Conduction losses also occur in the part if only a small section is being heated. Convection Losses are losses due to the flow of air/gasses across the surface of a heated part. Convection losses are typically smaller in magnitude and do not generally have a major impact in most applications. Curie temperature: The reversible point in a heating process in which a magnetic material loses its magnetic properties. For Iron (Fe) the Curie point is 770°C; for Nickel (Ni), it is 358°C; for Iron Oxide, (FE2O3), it is 622°C. Capillary action: In brazing, capillary action is the pulling force that draws the melted alloy into the gap between the parts being joined. Carburization: A process by which carbon is added t to a metal. Excess carbon can make metals brittle. Continuous Flow Manufacturing: A process that results in a balanced, just-in-time production system that minimizes excess inventory and maximizes throughpout. Controlled Atmosphere: A regulated atmosphere in which a heating process can be completed; usually used to ensure quality results. Brazing in a controlled atmosphere of nitrogen or argon instead of open air produces cleaner joints. Coupling Efficiency: The proportional relationship between the amount of current flow and the distance between coil and part. Placing the part close to the coil increases the flow of current and the amount of heat induced in the part. Curing: The toughening or hardening of a polymer material such as paint, epoxy or other adhesive, either by heat or the addition of chemical additives. Eddy Current: Circulating movement of electrical current within an electrical conductor caused by the intersection of the conductor with a moving magnetic field. Faraday's Law explains how a change in a magnetic field can create voltage. The law states that the amount of voltage created is equal to the change in magnetic flux divided by the change in time. The greater the change in the magnetic field, the greater amount of voltage. Fusing: A manufacturing process which utilizes heat to melt or bond to materials together. Glove Box: An enclosed workspace equipped with gloved openings which enable operator to allow manipulation materials inside the box. Glove boxes provide an excellent environment for controlled atmosphere brazing. 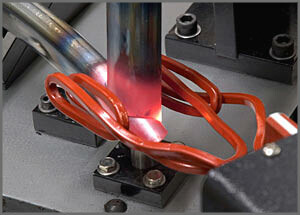 Heat Station: Part of the induction heating system that incorporates the heating coil. For improved flexibility, many induction heating power supplies are equipped with a remote heat station, which is connected by cabling to the main unit. Heat Treating: A combination of controlled heating and cooling cycles applied to a metal for hardening or softening. Hardening, annealing, and stress relieving are examples of heat treating processes. Heat Staking: The process of inserting a piece of metal into plastic. The metal is first heated, so that the plastic around the metal melts at first contact, and then cools around the metal, forming a firm bond [also known as shrink fitting]. Hysteresis: Heat produced by internal friction that is created when magnetic materials pass through the induction coil. Magnetic materials naturally offer electrical resistance to the rapidly changing magnetic fields within the coil. This resistance produces internal friction – from the process of repositioning the magnetic dipoles in the material – which in turn produces heat. Inductor: Specially-shaped copper tubing or other conductive material through which alternating electrical current is passed, creating a varying magnetic field. Depending on the application, the metal parts to be heated are either positioned close to the inductor or passed through it. But the parts are heated without actually touching the inductor. Induction Heating: A process which is used to bond, harden or soften metals or other conductive materials, by placing the part to be heated in a copper coil. For many modern manufacturing processes, induction heating offers an attractive combination of speed, consistency and control. Joule Effect: A scientific formula – also known as Joule's first law – expressing the relationship between heat produced by electrical current passed through a conductor. It is expressed as "Q = I2 x R x t" where Q is the amount of heat produced, I is the current flowing through the part (conductor), R is the electrical resistance of the part, and t = time. Pre-tinning: The process of pre-applying solder to metallic parts to improve the soldering process during the actual induction heating cycle. Quenching: Cooling a part with water after it has been heated. Radiation: Energy that comes from a source and travels through some material or through space in the form of rays or waves or particles. Light, heat, and sound are all examples of radiation. Radio frequency (RF): a frequency of electromagnetic radiation in the range at which radio signals are transmitted, anywhere from 3 Hz to 300 GHz. Radio frequencies are higher than audio frequencies and lower than infrared frequencies. Resistivity: The ability of a material to resist passage of electric current through itself or on its surface. Shrink Fitting: The process of inserting a piece of metal into plastic. The metal is first heated, so that the plastic around the metal melts at first contact, and then cools around the metal, forming a firm bond [also known as heat staking]. Silver brazing: Joining two pieces of heated metal with a third, molten silver alloy. Silver brazing produces a very strong bond but requires very precise machining tolerances. Soldering: the process of joining two pieces of metal by applying a third molten metal which has a lower melting point. Soldering is similar to brazing but it is done at lower temperatures and produces a less-strong bond. Susceptor: A metal plate which is heated by the induction process and then used to transfer heat to a non-metallic material. Tempering: A heat treatment applied to a metal after it has been hardened. The metal is first heated and then rapidly cooled to decrease hardness and increase toughness. Vacuum Furnace: An industrial furnace which heats parts to very high temperatures in a controlled atmosphere or vacuum; frequently used for brazing to improve joint quality.